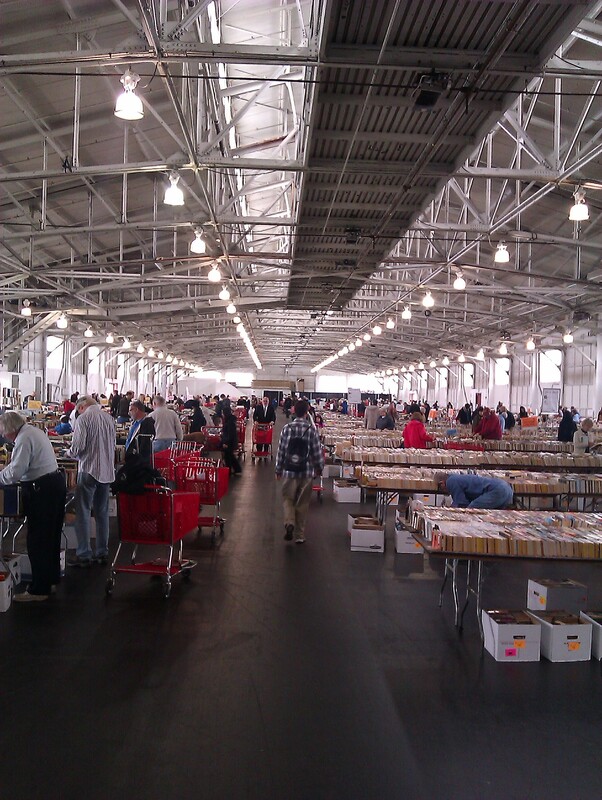 The Friends of the Public Library giant spring book sale at Fort Mason Center happened a couple weekends ago, and I helped out this year again as a volunteer cashier. Compared with antiquarian book fairs such as last weekend’s in New York (for a bookbinder’s-eye-view, see Gavin Dovey’s post here), the offerings at the Friends sales are somewhat more humble (though I have seen some rare editions go out the door for the mere $3 for a hardcover). But what I love about the Friends sales is that they are for people with a Serious Reading Habit, who have to have the real deal: a Book. I like to work the checkout lines at these sales to see what people are buying and chat with them about the thing that has brought us together: reading!!! That way, I also get to pair up with another volunteer, which makes the time go by quickly. 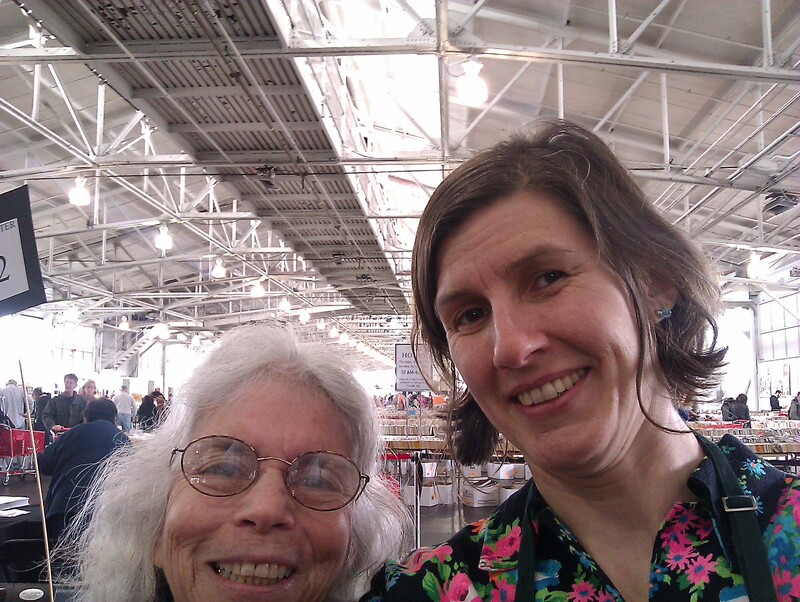 Laurie, who I worked with, is a retired math teacher from San Jose, and was superfun to work with. When our shift was over, I got to pick out some things for myself (as well as for my Intermediate Bookbinding class). I love to see all the books at the sales that reflect life in the San Francisco Bay Area: tons of back issues of Sunset magazine, hiking books up the wazoo, coffee-table photo books of highway 1, and tables full of books about Linux and other code- related endeavors. I was pretty happy to find a rare vintage copy of the 1971 Anybody’s Bike Book, published by Berkeley’s own Ten Speed Press. 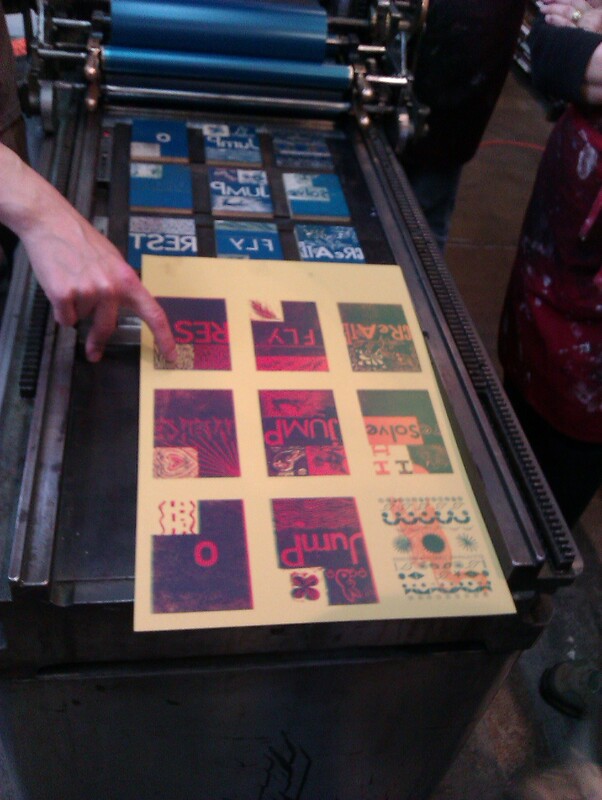 Another thing I did that same weekend was take a printing class at the San Francisco Center for the Book! As an instructor, I get credit to sign up for their other classes, and I never miss an opportunity to do so. This time I picked Double Trouble: Type and Image on the Vandercook with Adam Ewing. Check out his work here. So beautiful! In the class, we all carved linoleum blocks with images, then used the Center’s wood type as a base to transfer from and carve letterforms in our lino as well. With just two inkings, we made these cool posters. The field of printing and printmaking is totally new to me, and it’s a great learning experience for me to branch out a bit from bookbinding. Next week I will start one of the Friends of Calligraphy classes– of course I had to choose Bookhand. Typography, calligraphy, graphic design, and printmaking as well as bookbinding truly flourish here in the bay area– there is always more to learn.